They say you can’t help someone if they don’t want it for themselves. You can shove resources into their face, offer time, money, every ounce of yourself. But if they don’t want help, there is nothing you can do. Sadly, this is the case with my mother while she is dying from cancer. Maybe she’s in denial. Maybe she is still trying to be the strong, independent woman that raised six children on her own. But now, when I walk into her dark, dingy apartment – the smell of old dishes and mildew filling my nostrils – I feel like maybe she just wants to die. She has disconnected herself from us; much like when she was an alcoholic. We don’t know how to feel, what to say to her, how to help her. She has abandoned my siblings and I and it’s beginning to feel like she is already gone. My family has always been the epitome of dysfunction. Our mother kept us from knowing relatives, so none of us have ever dealt with a death in the family. Questions, stresses and frustrations all swarm my mind when I think about when she actually does pass- not fully for the pain of the loss of my only parent, but for the realization that we will have to plan a funeral. The dread of needing to clean up an apartment that has been hoarded in for nearly 30 years. There’s also the weight on our shoulders of what to do with our eldest sister who still lives there because of psychiatric issues that our mother chose to neglect and refused to address. My mom is choosing to let herself die and leaving us to handle all of the issues she never could. I’m not angry with her, which I know is a stage of the grieving process. I refuse to have anger toward somebody that did what she could with what she had (mentally, emotionally and physically). I spent enough of my childhood and adolescent being mad at her, hating her, wishing she would die. But now she is dying and it kills me to think that this is what she wants. It kills me to see her curled up in a fragile ball on a couch surrounded by boxes with all of the light bulbs in her home burnt out. It kills me that my eldest sister has to live in these conditions and see this image every hour of every day. And it kills me that my mom refuses to let us improve this. I’ve been grieving publicly for a few weeks and while it does mean a lot to me when I receive condolences, or when others relate with their own personal losses to cancer, I still feel alone in the fact that my mom is dying in these conditions. She’s choosing to be alone in these conditions. She’s choosing to abandon her children when she is all we have ever had. I tried expressing to her the other night that I was sad and scared and she told me to leave her alone, that she just wanted to rest. You can’t help someone who won’t accept it. My mother doesn’t want help. My mother wants to die. 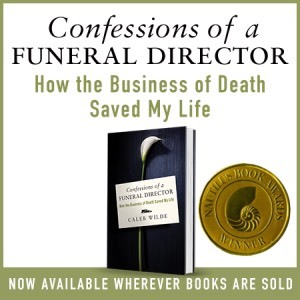 From Caleb: As a funeral director, I’ve had to learn to control my emotions. Not because I’m a selective empathetic, but because grieving families need me to be the level head in the midst of grieving souls. But I couldn’t control my emotions when I first read this post. I cried. I cried because Lynsie pulled me into her story. I cried because I’ve served families whose loved one’s have chosen to die alone. By their own choice. I’ve seen the empty pain in those left behind. The helpless pain. The grief that has been disenfranchised by the one who has died. When someone chooses to die along, it leaves behind a lonely grief. An orphaned grief. I hope this post finds its way to other “orphans” because I know it will give them a small sense of comfort, knowing that although your loved one has barred you from grieving, there’s a community of the lonely … an orphanage for the lonely grievers. Thank you Lynsie for being willing to share. This entry was posted by Caleb Wilde on December 6, 2013 at 10:09 am, and is filed under Death of a Parent, Disenfranchised Grief, Guest Posts. Follow any responses to this post through RSS 2.0.You can leave a response or trackback from your own site.